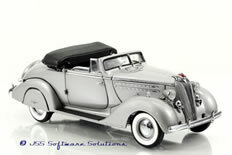 JSS Diecast Software: The Franklin Mint. JSS does not sell models. Please view our Products page to view a complete listing of what is available here. If you require further assistance don't hesitate to Contact Us; we have a working relationship with most mints and Independent dealers which may be able to assist you. View all models manufactured by The Franklin Mint. Our library is a reference of models produced by this manufacturer. Like pop always said: "You never know when a blind squirrel will find an acorn." Select a link to view models within a specific library from our list below. We hope one of these models "Pop Your Cork". Remember when you place your order to mention that JSS Software Sent you. Thanks!